Team USA’s Carlos Balderas (Santa Maria, Calif.) joined his roommate in the quarterfinals with his second victory of the Olympic Games on Tuesday morning in Rio de Janeiro. 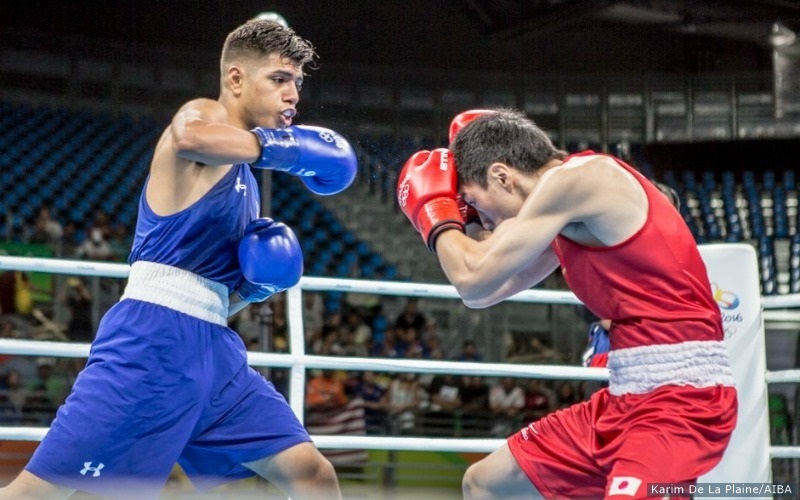 Balderas took on Japan’s hard charging Daisuke Narimatsu in today’s second round competition at the Riocentro Pavilion 6 on day four of boxing competition in Brazil. 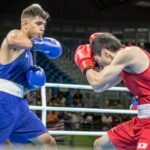 Balderas enjoyed two days off after opening Team USA’s competition on Saturday morning and he expended all the energy he’d stored in those 48 hours in an action packed bout with Narimatsu. It didn’t take for the punches to start flowing early in the bout as the two boxers traded shots over the first three minutes. Balderas landed clean, accurate punches on his Japanese opponent while working to keep him from landing shots of his own. In the second round, the two boxers sat in the center of the ring trading blows as Balderas scored with several great shots to the body and head. As has become his calling card, Balderas showcased great body work in an effort to slow Narimatsu down. The Japanese boxer came out strong in the third but Balderas staved off any type of comeback and went to win his second straight unanimous decision of the 2016 Olympic Games taking all three rounds of the match. The 19-year-old lightweight knew that body work was going to be key to the bout with such an aggressive opponent. “I knew I needed to the go body early because if I went to the body early, it would slow him down. I saw his fight the first day and I saw that he was very aggressive and kept coming forward so the best way for me to slow him down was the body and that’s what I did,” Balderas said. Once again, Balderas enjoyed strong family support in Riocentro 6 with nine family members screaming loudly throughout his bout along with his teammates who proudly chanted U-S-A. “I saw everybody (my family) was in the crowd behind the blue corner. Right when I was about to step in the ring, I looked up and saw my cousins and all my family screaming and yelling,” he said. Balderas and roommate Hernandez have now gotten their U.S. team off to a 4-0 start and both are one victory away from the medal stand. “It makes me happy because USA is getting really far like I said they would and now it’s time to enjoy this victory and I’ll be back on Friday against the Cuban but I’ll leave that to my coaches,” he said. He will face a stiff challenge in his quarterfinal bout as he faces former World Champion and 2012 Olympic bronze medalist Lazaro Alvarez from Cuba at 12:30 p.m. Brazil time (11:30 a.m. ET) on Friday. Middleweight Charles Conwell (Cleveland Heights, Ohio) will make his Olympic debut tonight against India’s Krishan Vikas at 6:15 p.m. local time (5:15 p.m. ET). Their bouts will be shown live via this link. The broadcast time and channel for Tuesday’s bouts will be posted as soon as it is available. 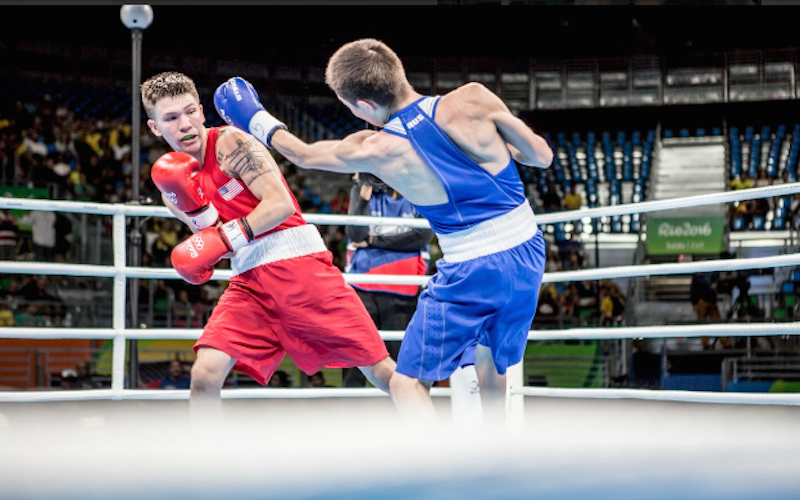 American light flyweight Nico Hernandez (Wichita, Kansas) upset number two tournament seed Vasilii Egorov of Russia on Monday night to score his second victory of the 2016 Olympic Games. Hernandez tuned out the boos in the arena and ignored his opponent’s resume to put on an impressive display of boxing in Monday’s second round action. While six of his seven teammates haven’t stepped in to the ring at the Riocentro Pavilion 6, Hernandez has already scored two victories and clinched his spot in the quarterfinal round. Hernandez opened the bout with a strong first round, finding an early home for his left hook. He finished the round with several strong shots to the head and the body to the displeasure of the crowd. The second stanza was the American’s strongest round as he started mixing in effective straight shots that snapped back the Russian’s head. Hernandez mixed in well-executed feints to confuse his opponent and won the second round on all three judges’ scorecards. Sensing he was down, the Russian came out aggressively in the round, looking to smother Hernandez and mixing in clinches and elbows with his punches. Hernandez withstood the Russian’s late attempted rally and won his second straight unanimous decision of the Olympic Games. Hernandez won’t have much time to enjoy his big victory, he will back for a quarterfinal match with Ecuador’s Carlos Eduardo Quipo Palaxti on Wednesday at 5:15 p.m. local time (4:15 ET) at the Riocentro Pavilion 6. A victory in Wednesday’s bout would clinch at least a bronze medal for Hernandez. Four weight classes were in action on Day Three of the Rio 2016 Boxing Competition, with eight crucial bouts deciding the quarter-finalists at Light Flyweight (49kg) and Heavyweight (91kg) as well four bouts at Welterweight (69kg) and Middleweight (75kg) across the two sessions. If the morning belonged to Spain’s Samuel Heredia following his victory over Irish second-seed Patrick Barnes, then the evening was Kazakhstan’s time to shine, as the team secured three superb wins. The day began with the confident figure of Cuban Johanys Argilagos delivering a brilliant Olympic debut that suggested he will take some stopping in his quest for the Light Flyweight gold. Argilagos’ first opponent, Britain’s Galal Yafai, tried to take the match to the 19 year-old sensation, but even a brilliant last round from the Brit wasn’t enough as the split decision went to Cuba’s newest star. Kenya’s Peter Warui put in two superb rounds to earn an unassailable lead against Lu Bin, picking a way through the Chinese boxer’s defence and absorbing his counter-attacks effectively. A late rally from Bin couldn’t turn the tide, and Warui’s reward for a hard-earned win is a Quarter-Final on Wednesday morning against Argilagos. Yurberjen Martinez halted Brazil’s Patrick Lourenço on the opening day of the Games, and after two rounds there was nothing to choose between the Colombian and Thailand’s Rogen Ladon. As the third drew to a climax, Martinez appeared to tire, but he dug deep to produce the stronger finish and march into the last eight. 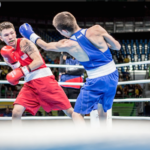 It was a case of experience versus sheer determination in the final Light Flyweight bout of the session, with Ireland’s two-time Olympic bronze medallist Patrick Barnes facing Spain’s resilient Samuel Carmona Heredi. Neither boxer was prepared to cede the centre of the ring in a contest of pure attrition and dozens of blows exchanged per round, and after going in to the third with honours even, Heredi was able to find another gear and a path into the quarters. In the session’s two Welterweight (69kg) bouts, Bulgaria’s Simeon Chamov used his considerable height advantage effectively against Onur Sipal of Turkey, before Venezuelan Gabriel Maestre delivered a brilliant performance against Germany’s Arajik Marutjan to join the Bulgarian in the second round. A strong start from Hungary’s Zoltan Harcsa in the first of the Rio 2016 Middlweight (75kg) contests quickly became an unassailable lead against Turkmenistan’s Arslanbek Achilov, putting the European into a tough second-round tie with Cuban World Champion Arlen Lopez. Four Heavyweight (91kg) bouts closed out the session, and signalled the return of Day One home-crowd hero Juan Nogueira, given the tall order of toppling Russian number-one seed Evgeny Tishchenko. Brazilian Nogueira looked to come in close and diffuse Tishchenko’s height advantage at every opportunity, landing some big uppercuts along the way, but Tishchenko stood firm to win the first two rounds, leaving Nogueira to put on a brave final flourish for his thousands of fans as he bowed out of the competition. After going behind to Tunisian Hassen Chaktami, Italy’s two-time Olympic silver medallist Clemente Russo used all his experience to come back strongly and book his place in the Quarter-Finals. He was joined by the Uzbek Rustam Tulaganov, a comfortable winner over Ecuador’s Julio Cesar Castillo, and Azeri Abdulkadir Abdullayev, winner over France’s second boxer of the session, Paul Biongolo. Monday’s evening session got underway with two blistering rounds from Uzbekistan’s Light Flyweight (49kg) Hasanboy Dusmatov against Joselito Velazquez, helping him carve out a lead that the Mexican’s late rally could not overturn. Dusmatov will now meet the experienced Kazakh Birzhan Zhakypov in the last eight, whose third Olympic Games got off to a winning start against Namibian Mathias Hamunyela. Ecuador’s Carlos Quipo will meet USA’s Nico Hernandez for a Light Flyweight Semi-Final spot after both came through testing evening-session bouts. Following a bye in the first round, the Ecuadorian was made to work hard to overcome Mongolian Gan-Erdene Gankhuyag, while Hernandez looked in sparkling form during his win against Russian Vasilli Egorov. The second round line-up of the Welterweight (69kg) competition was then completed as Italy’s Vincenzo Mangiacapre edged past Mexico’s Juan Pablo Romero and then, in the battle of the Olympic debutants, Britain’s Josh Kelly controlled his bout against Egypt’s Walid Mohamed, setting up a showdown with Kazakhstan’s former World Champion Daniyar Yeleussinov. In the evening’s first Middleweight (75kg) encounter, Ecuador’s Marlo Delgado built on his London 2012 Olympic experience with an impressive but draining win over Venezuela’s Endry Saavedra. Kazakhstan’s former World Champion Zhanibek Alimkhanuly also progressed, putting Anthony Fowler on the canvas early in the second round with one of several powerful lefts to which the Brit could summon no answer. Four Heavyweight bouts rounded off another superb day of boxing, with Vassily Levit clearly enjoying his Rio 2016 debut, stalking China’s Fengkai Yu for two-and-a-half rounds before the referee awarded the Kazakh a stirring TKO victory. Levit will meet Kennedy St Pierre in Wednesday’s Quarter-Finals after he saw off Algerian Chouaib Bouloudinats with some fierce blows to edge a split decision. A brilliant third round from Yamil Peralta saw the Argentine safely through a tough bout against Germany’s David Graf, but he will now face an even trickier last-eight tie with Cuba’s tough Erislandy Savon, who once again looked in great form against British rival Lawrence Okolie in the final bout of the day.